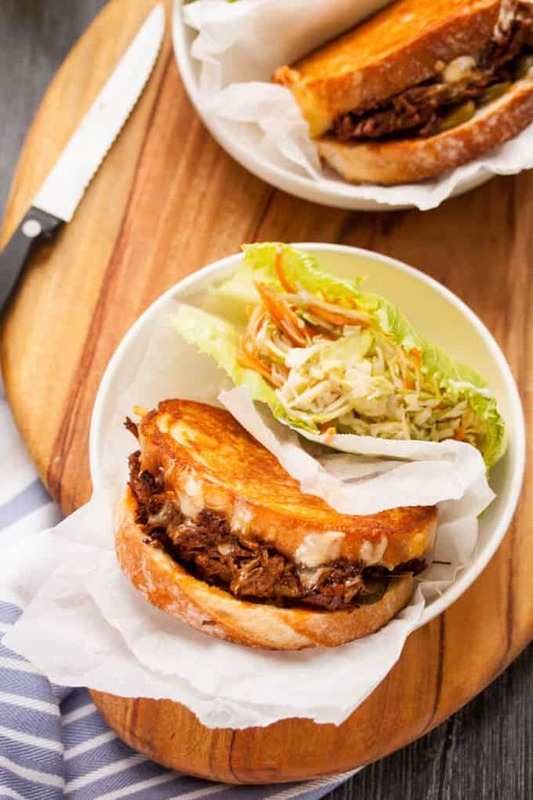 Succulent BBQ Beef Brisket, in a grilled cheese sandwich. A story of birthdays and leftovers. Is it just me, or do you always have masses of pulled meat leftover after slow cooking? I always do. It’s not entirely by accident. I love slow cooked meats and the leftovers always make delicious and super easy throw together meals. You can slow cook on the weekend, freeze the meat and then have all the comfort of a slow cooked meal in the middle of the week. Well this is just one such meal. Winning! Today I’m bringing you a super simple way to use up leftovers from roasts and slow cooked meats in the form of a gooey, cheesy, comforting toasted sandwich but also a whole bunch of other ideas for using up leftovers. My hubby recently had his birthday and this year it fell on Mothers Day (I hope all the mums out there had an awesome Mothers day and got spoiled rotten BTW ?). Being the sweetheart he is, hubby declined any offer to celebrate his birthday because he said celebrating the mums is more important. Awwww! And they say chivalry is dead. Anyways, that wasn’t gonna fly with me. He was getting a birthday and what’s more, it was going to be a surprise. I secretly got in touch with the parents and hubbys sister & brother-in-law and asked if they’d be able to make it for a surprise dinner on Saturday. Check! Rubbing my hands together in mischievous glee, I set about deciding what to cook. Ok, so how do you cook for 8 adults but make it look like you’re cooking for 2? Well, if you’re me, it’s easy given my penchant for seriously over-catering for anything. So, I figured a large chunk of meat in a slow cooker wouldn’t get a second thought from hubby (more like an eyeroll and a “she’s done it again”, haha). So I decided on Slow Cooked BBQ Beef Brisket Tacos. He would have become a bit suspicious if I started making a load of sides and starters though. Fear not, my mum-in-law makes a great potato salad, which also happens to go very nicely with slow cooked beef brisket, so that was an easy request. My mum makes The Best Homemade Sausage Rolls which I love so much I’ve done a post, so I put her on sausage roll duty. Sis-in-law helped out with her yummy corn relish dip and balloons, of course ? It all went off without a hitch. He didn’t suspect a thing. Yes, he did think it was a rather large chunk of meat and yes, he did think “She’s done it again”. I also made him a delicious chocolate cake that I promptly forgot to take a photo of. And what a great feeling to see the surprise on his face when everyone turned up at the door. It was a really great night. The main recipe is not for the brisket. It’s a recipe for what to do with the leftovers from said Beef Brisket of which there was plenty even after 8 adults and a super-cute 2 year old had finished with it. Did I mention it started out as a 2.2kg piece of beef brisket. No. Oh well, moving on. I know a leftovers recipe seems like a simple plan but some people really get lost trying to work out ways to use up leftovers and make them exciting again. 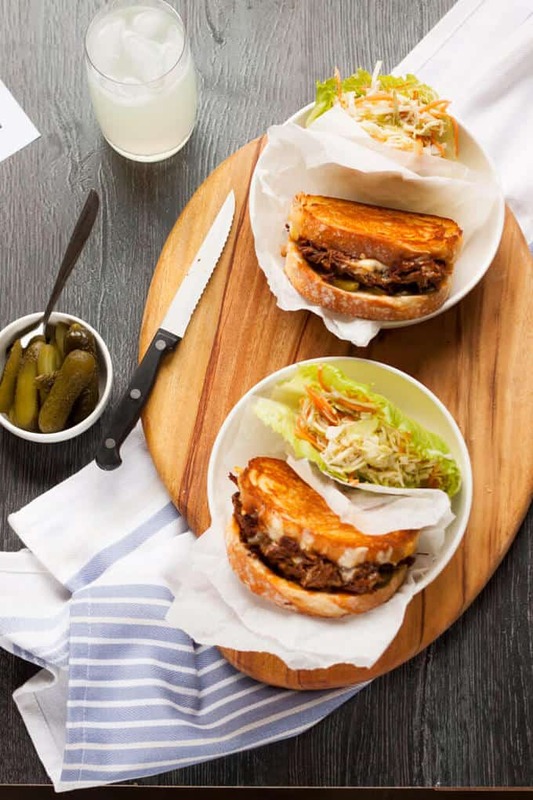 I for one am not a fan of eating the same thing day after day, so I’ve got some inventive ways, along with this sandwich, to use up your leftover roast meats or slow cooked meats so they don’t go to waste. Once I started this list, I found it hard to stop (can you tell?). That’s good news because there is just so much you can do with leftover meat. I’ve added a second recipe below to cook the beef brisket form scratch. I served it with the potato salad, a coleslaw, deconstructed guacamole (aka chopped tomato and avocado), a green salad and some cheese. Do you have any other great ways of using up leftovers? I’d love to hear them. Do you love slow cooker meals? Me too! Maybe give these a try. 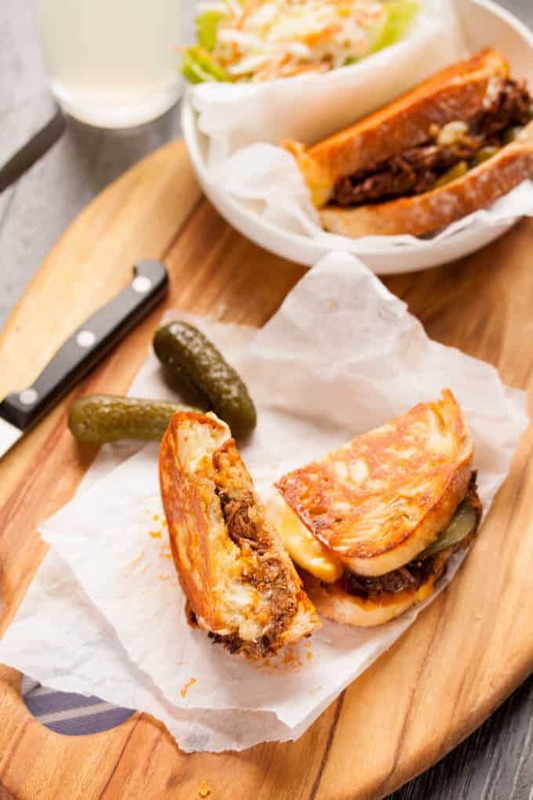 Succulent BBQ Beef Brisket, in a grilled cheese sandwich. Preheat a sandwich press, grill press or grill pan. Spread margarine or butter over 1 side of each slice of bread. 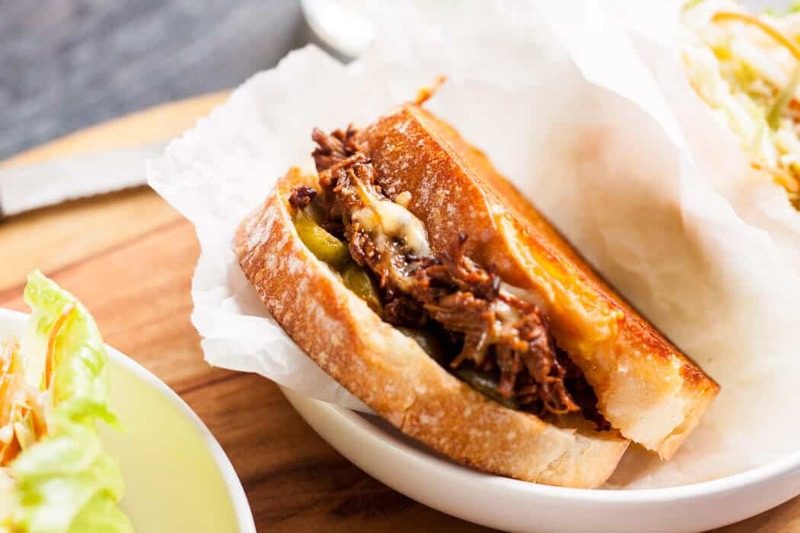 On the non-buttered side of bread, top with mozzarella, beef brisket, gherkins, and cheddar and then top with another slice of bread (buttered side on the outside). Repeat with remaining ingredients to make 4 sandwiches. Grill until heated through and cheese is melted. And to make the Beef Brisket …..
Succulent, flavourful beef brisket, slow cooked for 10 hours in a BBQ sauce. Mix together the dry rub ingredients and rub all over the brisket. Now heat half of the oil in a heavy based pan. Brown the meat on all sides and set aside. In the remaining oil, saute the onions and garlic until translucent. Add the red wine and allow it boil and reduce by half. Now add all other ingredients EXCEPT the flour, and mix well. Place the whole shallots and bay leaves into the slow cooker. Add the beef, then pour the sauce all over the top. Cook on low for 8-10 hours until the meat is falling apart. Remove the beef and use 2 forks to shred the meat. Skim the oil from the top of the sauce and discard. Strain the sauce into a saucepan. Whisk in the flour and allow the sauce to simmer away until it is nicely thickened. Add some salt and pepper to taste. Stir the meat through and serve.